Cure the Monday blues at the Grand Daddy Hotel’s Pink Flamingo Rooftop Cinema. The Grand Daddy Boutique Hotel’s old school-style Pink Flamingo Rooftop Cinema is the answer to any Blue Monday. The unique outdoor setting makes for a fun, colourful and cosy way to celebrate some silver-screen classics. 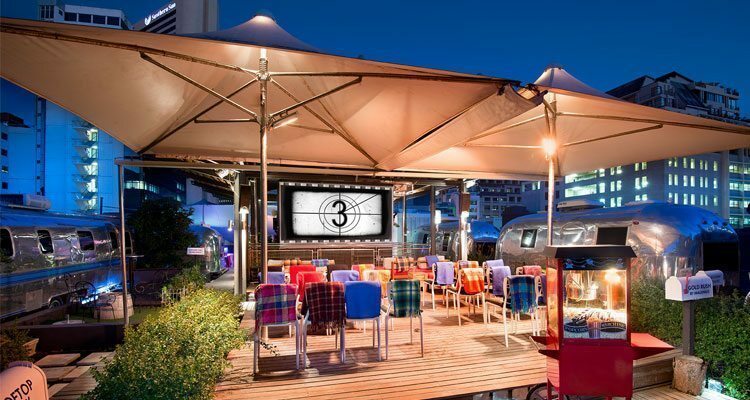 We love the vintage bioscope feel, kind of like a drive-in – the only difference is its fabulous location, at the only rooftop trailer-park hotel in the city. Snuggle up for your movie (R130 per ticket) among the seven vintage Airstream trailers on Grand Daddy’s rooftop, in the general section, or on the couch. Included in your ticket is a welcome drink, bag of sweets and, of course, some popcorn. For an additional cost, you can add a delicious picnic basket to your movie experience. Please note Picnic orders must be placed when you book your tickets, not upon arrival for the movie, to give the staff time to prepare and package your hamper. Dress warmly, especially on cooler nights – and, in the event of bad weather, please check with the hotel that the movie is still going to be screened. Movies start at 6pm, but it’s best to arrive early to reserve your seats and enjoy your welcome drink.